There's never a dull moment to be had in the life of a mom! Though Motherhood is one of the single most rewarding experiences, thing's can certainly get a bit hectic! Taking time to relax and rejuvenate is definitely necessary now and then; not only so that we can be at our very best for our family, but for our own well-being as well. So, why not show mom [or reward yourself, as a mom] with some time to relax and rejuvenate this Mother's Day? Calgon® Ageless Bath™ - Luminous Bath Pearls: These bath pearls make the bath water super soft and have a wonderful soft scent. They also add a touch of shimmer which leaves skin soft and luminous. Calgon®Parisian Charm Body Mist: This scent is gorgeous! As one of the newest scent additions to Calgon's line-up, Parisian charm offers up a sweet mixed floral's scent with a deeper vanilla musk undertone. This is my personal favorite from Calgon! Calgon® Nourishing Body Cream - Blushing Blossoms: This body cream is sensational! It offers a ultra-nourishing formula with Vitamin E, A and Aloe - which leaves skin feeling super smooth and hydrated all day long. The Blushing Blossoms scent is one of the newest additions to Calgon's line-up. The light floral accents in this scent are subtle and fabulous. The Blushing Blossoms scent would make the perfect pick for the girl that enjoys a soft and feminine fragrance. 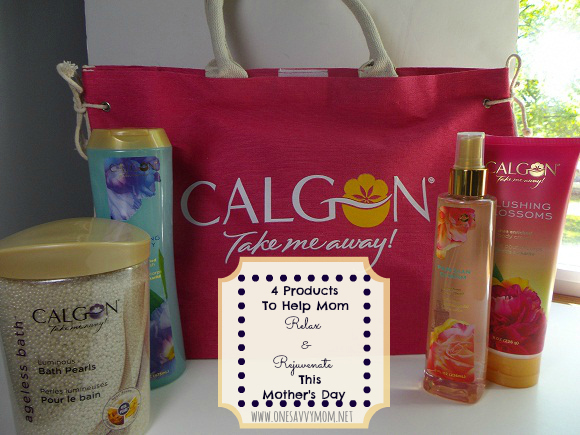 Our thanks to Calgon for providing review samples. All thoughts and opinions expressed are our own.